With contemporary lines and chrome hardware, Safco's Custom Designer Series Flat File is a stylish addition to your office. This heavy gauge steel file is stackable up to five units high, so it saves valuable floor space. Case-hardened ball-bearing rollers provide you with smooth, quiet operation, and positive closures keep your drawers tightly shut. Courtesy stops keep drawers in place while open. Use the label holder to clearly mark your drawers. Choose from several great powder-coat paint colors to match your décor. This Safco Custom Designer Series Flat File with Five Drawers is made in the USA and comes backed by a 15-year warranty. GREENGUARD certified. Fits Sheet Size: 34" x 44", A0, 36" x 48", 50" x 38"
Fits Sheet Size:	28" x 40", 43" x 32", 30" x 42"
With contemporary lines and chrome hardware, Safco's Custom Designer Series Flat File is a stylish addition to your office. This heavy gauge steel file is stackable up to five units high, so it saves valuable floor space. Case-hardened ball-bearing rollers provide you with smooth, quiet operation, and positive closures keep your drawers tightly shut. Courtesy stops keep drawers in place while open. Use the label holder to clearly mark your drawers. Choose from several great powder-coat paint colors to match your decor. This Safco Custom Designer Series 40 3/8" Flat File with Five Drawers is made in the USA and comes backed by a 15-year warranty. GREENGUARD certified. Fits Sheet Size:	22" x 34", A1, 24" x 36", 37" x 26"
With contemporary lines and chrome hardware, Safco's Custom Designer Series Flat File is a stylish addition to your office. This heavy gauge steel file is stackable up to five units high, so it saves valuable floor space. Case-hardened ball-bearing rollers provide you with smooth, quiet operation, and positive closures keep your drawers tightly shut. Courtesy stops keep drawers in place while open. Use the label holder to clearly mark your drawers. Choose from several great powder-coat paint colors to match your decor. 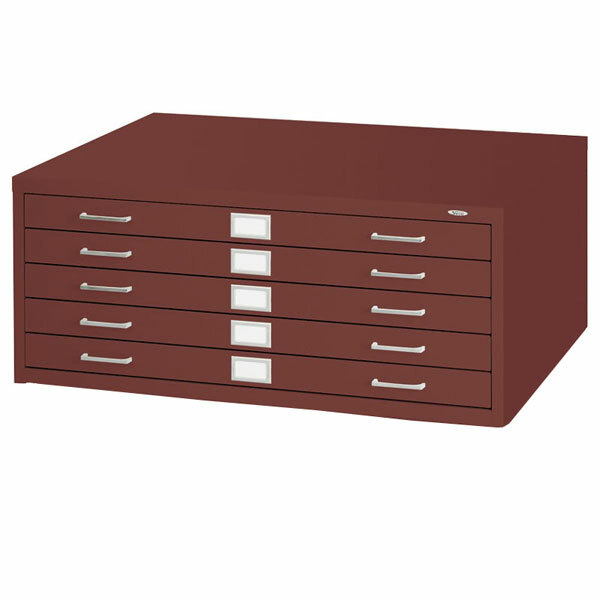 This Safco Custom Designer Series 46 3/8" Flat File with Ten Drawers is made in the USA and comes backed by a 15-year warranty. GREENGUARD certified. Safco's Custom Designer Series Flat File has contemporary lines and chrome hardware, that make it a stylish addition to your office. This heavy gauge steel file is stackable up to five units high, so it saves valuable floor space. Case-hardened ball-bearing rollers provide you with smooth, quiet operation, and positive closures keep your drawers tightly shut. Courtesy stops keep drawers in place while open. Use the label holder to clearly mark your drawers. Choose from several great powder-coat paint colors to match your decor. This Safco Custom Designer Series Flat File is made in the USA and comes backed by a 15-year warranty. GREENGUARD certified. Call (877) 839-3330 and our customer service team will be happy to assist you.